With the arrival of summer and the end of the school year upon us, it’s a good time to take stock of our reading goals for the year. After all, summer is a perfect time for reading, whether it’s enjoying a good beach read on vacation, lazily paging through a classic while sitting on the porch feeling too hot to move, or working on an assigned reading list for the upcoming school year. And if you’ve gotten a little lazy about that New Year’s resolution to read more books this year as the months have gone by, the end of a school year feels like a good time to make a fresh start. One great way to make headway on that to-read list is by joining a book club, either in person or online … but what if there isn’t one near you or you can’t find one that appeals to you? Beverly Cleary once said, “If you don’t see the book you want on the shelves, write it.” Similarly, if you don’t see a club you want to join, perhaps you should create one. Starting a book club takes a bit of planning, but the effort can be well worth it. Not only will you be more motivated to read, but you’ll also be setting time aside to get together with friends on a regular basis. Thinking that you don’t know the first thing about how to start a book club? Don’t worry: We’re here to help. What will be the focus of your book club? You might choose to read books from a specific genre, like historical fiction or mysteries, or books by only female authors, or translated works by foreign authors, or novels that have topped the best-seller list or won major literary awards. Having a theme can help give potential members an idea of what they’ll be reading and make it simpler to choose the group’s selections. Who’s going to run the meetings? You can put yourself in charge of facilitating the discussions, but many groups choose to rotate the responsibility so that one person doesn’t get burned out. How often do you want to meet, and where will you do it? 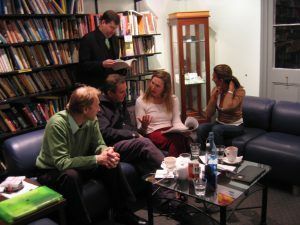 Most in-person book clubs meet monthly, but you can choose whichever time frame is likely to work best for your group. You’ll set the definitive schedule with input from the members, but it’s good to have a timetable in mind in the planning stage. As for where the meetings will be held, popular choices are either members’ homes or a meeting room at the local library or community center. How big do you want your group to be? You’ll want to keep this number manageable, so don’t get carried away: If the group’s too big, you won’t be able to find a comfortable space to meet in and it will be harder for everyone to be able to participate in the discussion. Aim for a number between six and 16. Once you’ve done the initial planning, it’s time to invite some people to join you. Think carefully about who you’d like to invite. If you want the group to include your current friends, that’s fine, but you might also consider making some new friends by hanging fliers at local libraries or bookstores to recruit members. Discuss and decide on a set schedule, choosing a time, day of the week, and location as well as how often you’ll meet. Talk about who will run the meetings: Will you choose one person to facilitate your discussions, or will you rotate? Many book clubs choose the latter to avoid the potential for burnout. Pick a book to start with, and decide on how you’ll choose future selections. Some groups throw out suggestions and take a vote at each meeting, while some let each member take a turn choosing. If you’d like, choose a name for your group. This isn’t strictly necessary, but coming up with clever names can be fun. Make sure to collect everyone’s contact information and give out copies of this list to all of the members. That way, if something comes up that forces you to change the time or location of the next meeting (such as a family emergency for the host or a massive snowstorm), you can let everyone know. Keep discussions civil and relevant to the book. Finish the book before the next meeting. If you haven’t finished the book, come anyway; you’ll probably still have valuable thoughts to contribute. Don’t bring along extra people; if you know someone who wants to join, discuss it with the group first. Don’t complain when you don’t like the book that’s been chosen. You’ve got your group in place. You’ve figured out where and when you’re meeting. And you’ve finished reading the first book. And then, it dawns on you: You have no idea how to run a book club meeting. Don’t panic. Much like when you were figuring out how to start a book club, you just need to do a little bit of planning to make things go off without a hitch. Before the meeting, come up with some discussion questions to use. A growing number of books these days come with discussion guides in the back, which can be a helpful starting point, but feel free to come up with your own ideas, too. Also consider what people are saying about the book online: Critics’ reviews and comments on social media can provide good jumping-off points for discussion. When it’s time for your book club meeting to begin, getting things started can be as simple as asking everyone what they thought of the book. Often, the discussion will go on from there without much help. But if the conversation falls into a lull, pose some of your discussion questions to keep the ball rolling. It’s also your job to make sure that the book club rules are followed: For instance, if one person is dominating the conversation, interject and try to guide the discussion so that others have a chance to speak. And if things get too far off-topic, bring everyone’s attention back to the book by posing another question or making a comment to lead the conversation in the right direction. You also have one more responsibility, and that’s making sure that the group plans for the next meeting. 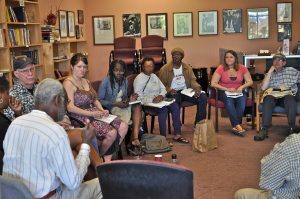 Set aside a few minutes to discuss and decide on the book you’ll read next, and if your group is taking turns leading the meetings, ask for a volunteer to take the reins.